Oftentimes, we focus on appliances and gadgets that are relatively affordable. It’s nice to do a little window shopping now and then, and that’s what we’re doing here—looking at next generation smart fridges that come with mortgage-payment-sized price tags. All these smart fridges cost more than my (and possible your) first car, but they’re also pretty cool—pun definitely intended. Although currently out of the budget of most consumers they offer a really neat peek into the future of the industry and showcase features we’ll likely all take for granted within the next ten years. Here’s our pick of the bunch. 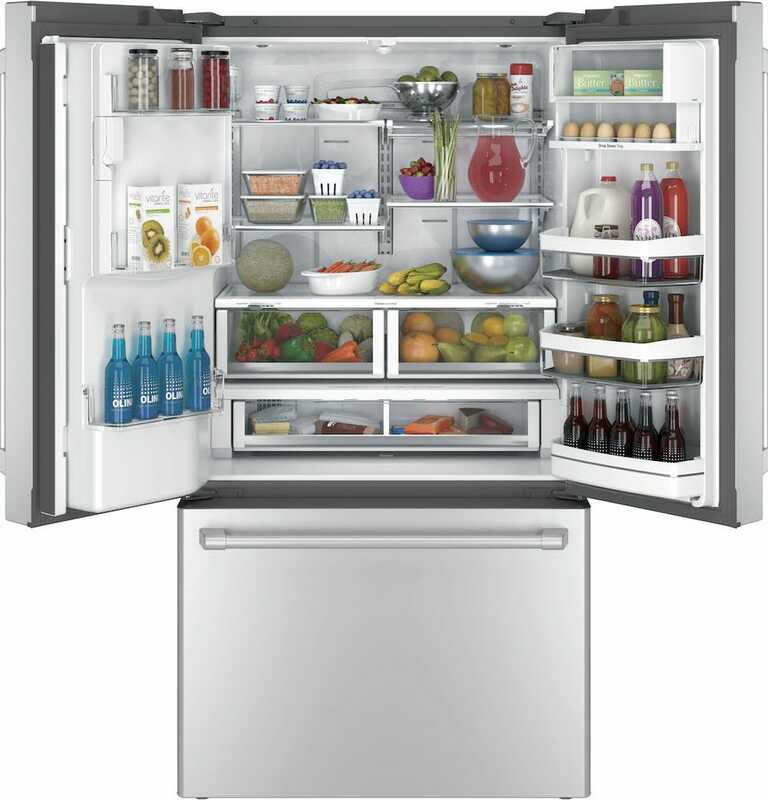 The Kenmore Smart 75049 24 cu ft French Door Refrigerator is smart in more ways than one. It looks stylish, its door arrangements are perfect if you want to get the most out of the space, and it’s intelligent when it comes to catering for your needs. Within its confines are a wealth of shelves to store all your food items, pitchers, and water bottles. Alongside it is room for an ice maker with options for ice water, cubed, or crushed ice. Where things get more intelligent is the Kenmore’s connected smart app. Through the app, you can adjust the temperature, opt to make ice from a distance, or simply check on how the water filter life is performing. There’s even alerts for if the fridge door is left open. It’s compatible with Alexa too, so you can always tell it what to do rather than tap. 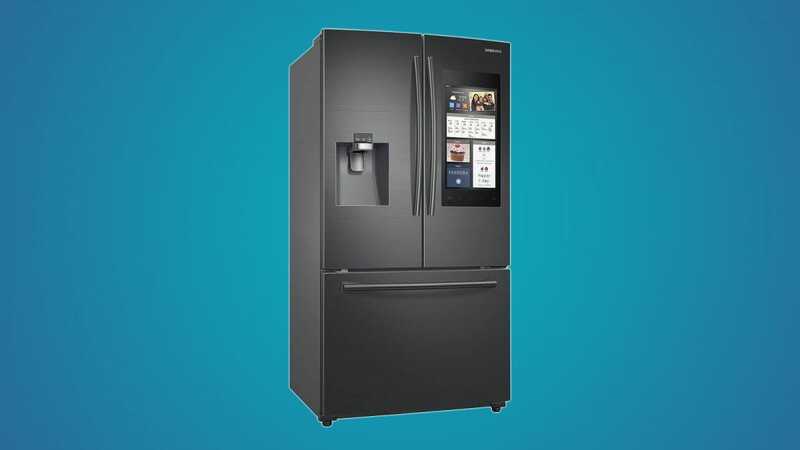 When you think of smart fridges (if, honestly, you’ve thought about them much at all) you probably think about the much-advertised and much-written about Samsung Family Hub fridge. Its giant-tablet-in-the-door design has, more or less, become the face of the product niche in the last few years. The Samsung 24 cu ft 4-Door Flex with 21.5in Connected Touch Screen Family Hub Refrigerator acts as more than just a refrigerator—Samsung pitches it as a place to manage your home life. How does it pull off such a feat? Its 21.5″ touchscreen provides a lot of useful features, many of which are cribbed from an analog lifestyle. You can use it to create shopping lists before sending them over to a relevant person’s phone. You can view inside the fridge via the 3 built-in cameras, set expiration notifications so nothing goes stale, and more. The hub can also be used to share calendar dates with others, post photos or memos. It’s a modern day spin on the traditional fridge door—right down to being able to ‘pin’ a baby photo to it. 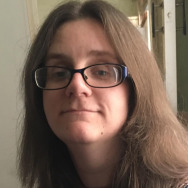 It also works as a music streaming service with support for Spotify, Pandora, and Tune-In Radio, saving you from the need to own a separate radio. 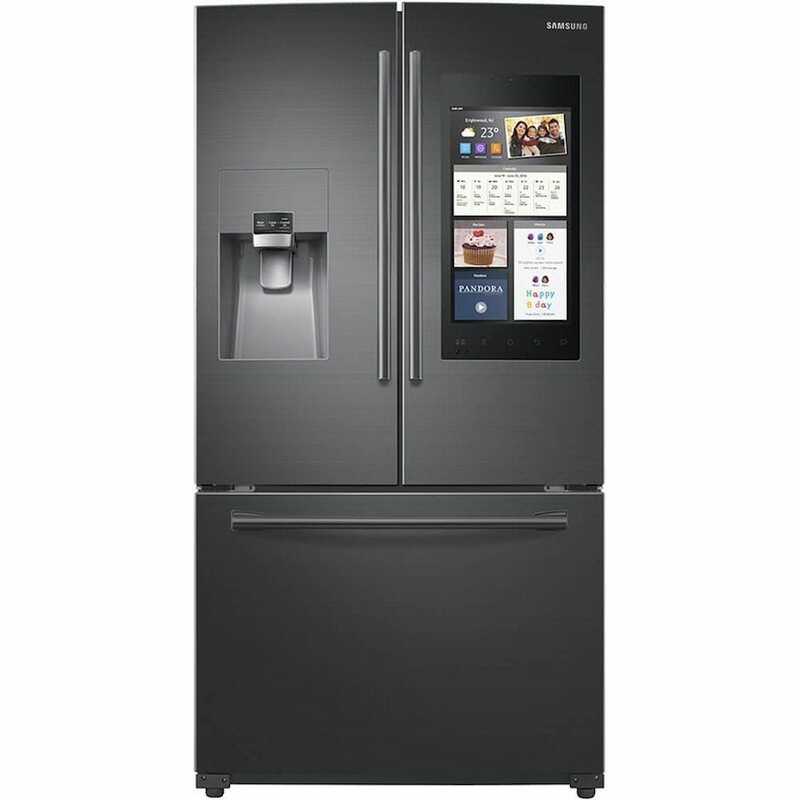 Plus, as a fridge, the Samsung 24 cu ft 4-Door Flex with 21.5in Connected Touch Screen Family Hub Refrigerator is pretty great with effective temperature control, an ice and water dispenser, and adjustable shelves. Suitably stylish and slotting alongside your counters perfectly, the LG Black Stainless Steel Series 23 cu. ft. 4-Door Counter-Depth Refrigerator with Door-in-Door® is pretty clever too. Utilizing LG’s SmartThinQ Technology, the fridge and smartphone app keeps you constantly informed of everything you need to know. Through it, you can crunch some ice to get it ready for your drink, get a heads up if the fridge door has been accidentally left open, and be able to activate vacation mode from anywhere, saving you money and energy. You can tweak the temperature remotely too. Alongside that is LG’s Door-in-Door feature making it easier to grab your favorite snacks fast, and there’s a fold-away tray that’s great as a staging area or for filling a glass on. It’s those little things that make the LG refrigerator so appealing. 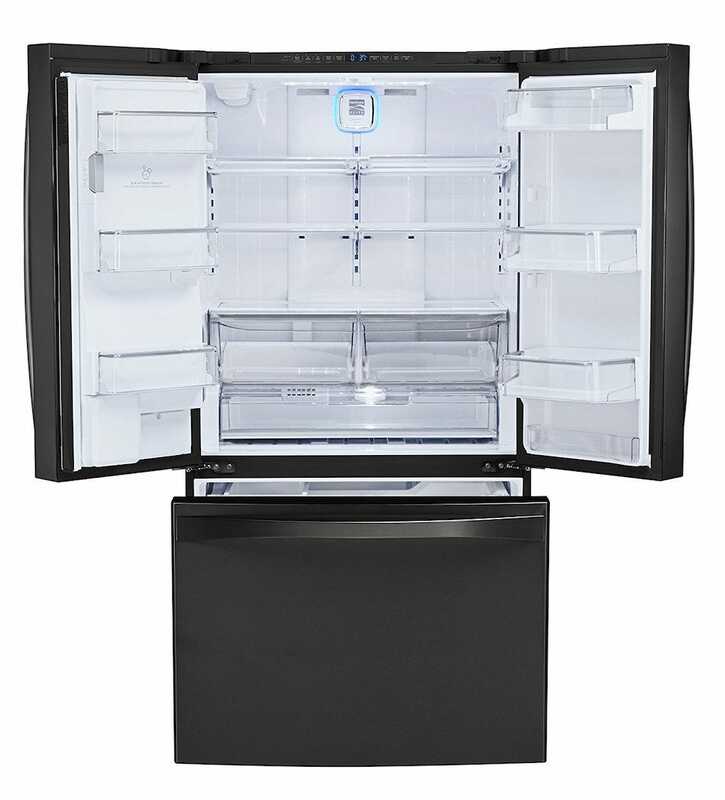 The GE Café™ Series ENERGY STAR® 22.2 Cu. Ft. Counter-Depth French-Door Refrigerator with Keurig® K-Cup® Brewing System doesn’t look quite as stylish as the others here, but it still packs quite the punch (and certainly has the longest name). 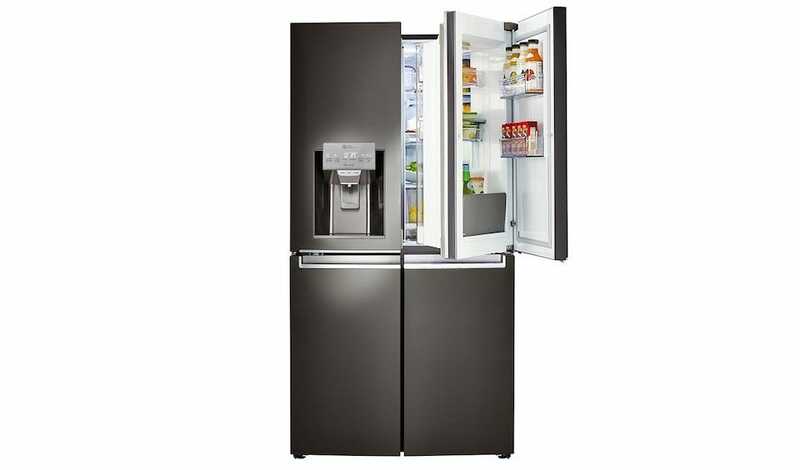 Impressively for a fridge, it offers not only a dispenser for filtered cold water, but a Keurig K-Cup Brewing System. The ability to dispsense a single serve cup of coffee from an appliance typically used for cold things is a neat touch. Elsewhere, the GE Café refrigerator has extensive smart features which are accessible through its app. You can, for example, schedule a time for the hot water component to heat up so the dispenser is ready to make coffee or tea when you wake up in the morning, with additional options to tweak the temperature to your liking. Alexa support means you can talk to your fridge instead of tap the app, and there’s IFTTT support too. As a fridge, it’s a great size too, so you’ll never run out of room to store produce. Money no object? In need of style over many features? 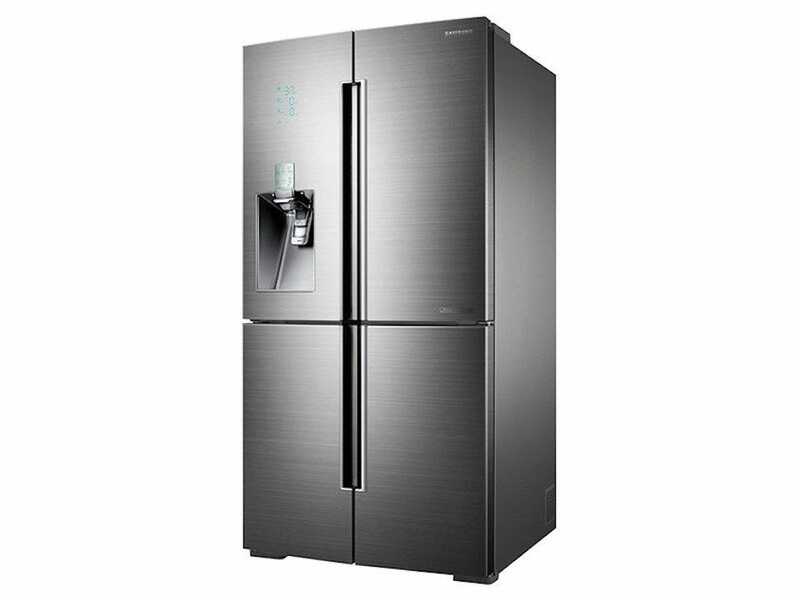 The Samsung 21 cu ft. Capacity 3-Door French Door Panel Ready 36″ Built-In Chef Collection Refrigerator is the fridge for you. It’s incredibly sleek and stylish for a refrigerator, as part of Samsung’s Chef Collection. A 3-door French Door panel, there’s plenty of room to store your produce and drinks. Features wise, it has a remote view camera that’s Wi-Fi Enabled. That way, you’re able to view what’s inside your refrigerator from anywhere in the world via your smartphone. It’s great for those times when you can’t remember if you needed milk or not. Each compartment of the fridge is separately controlled so it’s possible to set three different temperatures. Also, there’s the practically obligatory water dispenser. The fridge might lack the practicalities of the Family Hub seen elsewhere in Samsung’s range, but it’s great for those in need of a stylish solution that’s still quite smart. If all those stupidly expensive fridges with super neat features are leaving you looking at you regular old dumb fridge with a baleful eye, don’t give up on it just yet. As cool as all these fancy new fridges are, there’s still a very strong argument against jumping on the smart fridge bandwagon and sticking with tried and true offline designs instead. Still, it’s fun to window shop and see what’s in store for the kitchen of the future.